Boston, MA - Hot on the heels of their critically acclaimed self-titled debut album, Boston rockers Neon Alley are releasing a new video “That's How It Is”! A Young Woman wakes on the floor, trapped in a nebulous white room. It's minimalistic and sparse but evokes the future. There's only a white cube furniture piece with a VR headset on the center. She waves her hand over the cube and holograms of the band appear behind her (in the style of Star Wars holograms). They begin to play. As the guitar lead begins, she dons the headset and is taken to various spaces in a Virtual Reality world. And in each scene she becomes a different person. In each scene she experiences what it's like being in someone else's body through her avatar. Some bodies are interesting. Other bodies are uncomfortable. So she leaves each scene in search of a better body/persona until she finds herself in an avatar that looks just like her own body except she's clean, nicely dressed in 50’s retro style. The body fits so well that she begins to dance and rocks out, having the time of her life. Says guitarist and band leader Dave Vaccaro, “The video, like the song is about the people we cross paths with and interact with everyday. Kind, clever, smart, slow, inspiring, funny, good or bad. It's just how people are and that's never going to change. The only thing that you can control is how you react to them. Like our woman in theVR headset (played by Shannon Ashe), some of the people she becomes she likes. Others she finds interesting, and still others she can do without. “Wouldn't it be interesting to be somebody else for a time? Who would you be if you could be someone else for a day? “Directed by Valdimir Minuty the video is one of several interpretations of the song that the band felt best represented the idea of 'That's How It Is'. Since Vlad is an artist as well as a film maker (he does great story boards BTW) he was able to translate the feel of the song in a very basic way that worked quite well given the limited resources we had available to us. BACKGROUND: David Vaccaro's story in music has a rare upward sweep. Vaccaro has journeyed from hardscrabble Boston club dates to the 90's music scene of Los Angeles and creative collaborations with some of melodic rock's platinum selling vocalists. 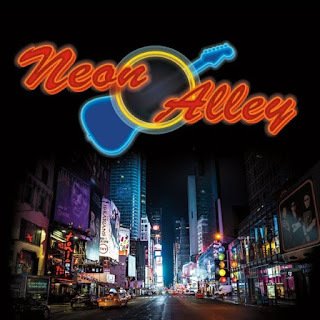 With the self-titled debut album of his new band Neon Alley (out on DMV Music), Vaccaro revisits that visceral soulfulness of his early days. This collection of originals including a cleverly re-imagined cover is perfectly crafted for sweat-soaked live performances.